Since it’s origination in 1982, the Le Grizz 50-mile Ultramarathon has commenced every autumn on the second Saturday of October. From 1982 to 2014, an upwards of 100 runners stood half awake on the frozen ground near Spotted Bear Ranger Station alongside the Hungry Horse Reservoir, waiting anxiously for a ceremonial shotgun blast to signify the start of one of the oldest 50-mile footraces in the world, and the first in Montana. For those 33 years, the man with his finger wrapped around the trigger was Pat Caffrey. Alongside Pat were the Cheetah Herders, a gratuitous group of self described misfits. The Herders formed (after a particularly long Montana winter, resulting in plenty of time to contemplate) to promote events soliciting athletic participation of their peers in wildland setttings. In 2015, Le Grizz changed both in ownership and location. The Polebridge Mercantile purchased the event and moved it to the North Fork of the Flathead River. The race now starts and finishes at the historic “Merc”, as the locals call it, where runners and their crew can take advantage of a toasty fire, fresh baked goods and hot coffee as they wait for the gun shot. Pat Caffrey has been assisting the Mercantile with the event’s transition to this day, keeping his gun loaded and the course miles marked. 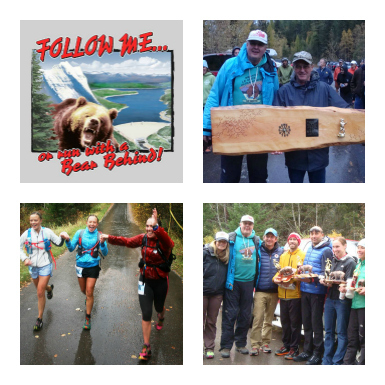 He intends to remain involved with the race for the foreseeable future and the promise of the Le Grizz remains true on both forks of the Flathead– gorgeous, eye-popping scenery, and the chance to be chased by a grizzly bear.